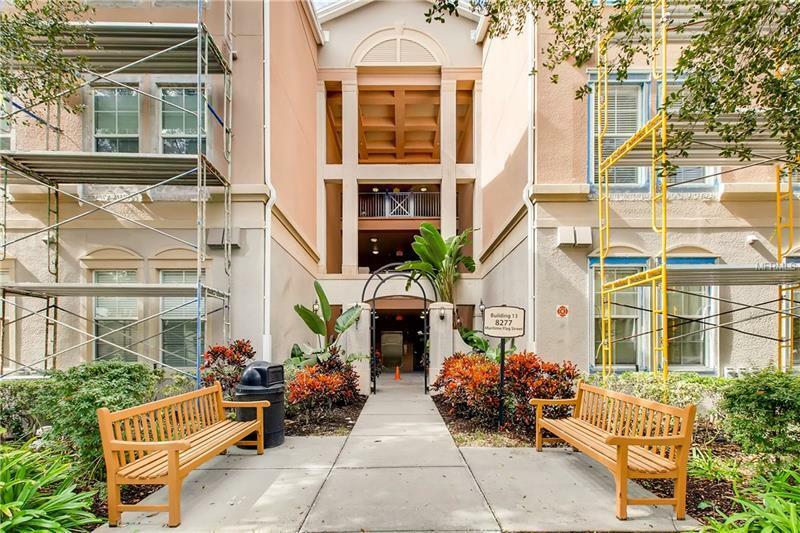 Come and visit this beautiful and spacious third floor Condo with elevator access in Windermere! This stunning 3bedroom/2bathroom home has an open kitchen with granite countertops and a breakfast bar. The 42â cabinets provide lots of storage space. All appliances in like-new condition are Stainless-Steel, including a French Door Refrigerator. The open space concept in the living/dining room area is perfect for entertaining family and friends. All the social area has beautiful Laminated wood floor and sliding glass doors provide access to the screened balcony to expand the entertaining area and enjoy Florida weather. Crown Molding throughout adds a touch of elegance. Split floor plan for maximum privacy. The Master Bedroom has an oversized walk in closet and the Master bath includes dual Sinks and bath/shower combo with glass door. 2nd and 3rd bedrooms are on the opposite side separated by a space saving laundry area fully equipped with washer and dryer. This resort style community has a gorgeous nearby pool, cabana, volleyball court, fitness center and state of the art clubhouse. Assigned parking space in front of every unit. This property is in perfect condition and move-in ready. Conveniently located nearby Restaurants and supermarket across the street in Lakeside Village Center. A-rated schools, just minutes from Winter Garden Village, Disney, I-4, 429, Turnpike, SeaWorld and more. Pet Restrictions: Two pets maximum with a combined weight not to exceed 50 pounds. Copyright © 2019 Mid Florida MLS. All rights reserved. The data relating to real estate for sale on this web site comes in part from the Internet Data Exchange Program of Mid Florida MLS. Information provided is for consumer's personal, non-commercial use and may not be used for any purpose other than to identify prospective properties consumers may be interested in purchasing. Charles Rutenberg Realty participates in the MFRMLS Internet Data Exchange (IDX) program, allowing display of other MFRMLS broker's listings on this site. However may not include all listings currently available. Information is deemed reliable but not guaranteed. Information last updated at 2019-04-21 15:03:01.